One gets bored quickly of eating the same breakfast every day especially when it is eggs and bread. 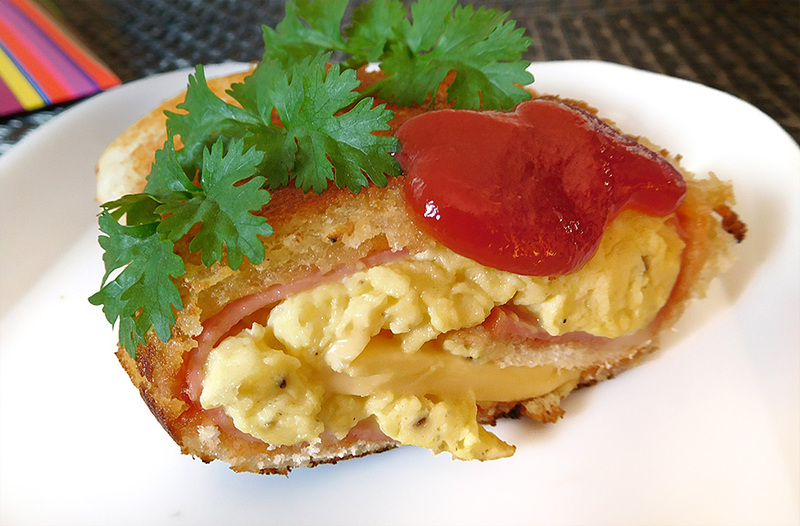 Here is a novel recipe to make scrambled egg rolls. Believe me, it tastes so good that you would want to make a complete meal of it, and why not? Make it this weekend and let me know how you like it. Scrambled eggs is a dish made from whites and yolks of eggs (usually chicken eggs) stirred or beaten together in a pan while being gently heated, typically with salt and butter and variable other ingredients. Only eggs are necessary to make scrambled eggs, but nearly always salt is used, and very often other ingredients such as water, milk, butter, cream or in some cases crème fraîche or grated cheese may be added. The eggs are cracked into a bowl; with some salt, and the mixture is stirred or whisked: alternatively, the eggs are cracked directly into a hot pan or skillet, and the whites and yolks stirred together as they cook. Roll the breads with rolling pin to make a sheet. Gently lift a corner of the flattened bread and start rolling and roll it completely. Heat a pan, brush oil and fry the roll in the pan. Garnish with greens and serve hot with tomato ketchup. Hi, While I have some recipes that use Airfryer, this one does not. Can you please tell me which Airfryer cooking site you found this recipe on?